Tópicos: Bgea Web Sites, Billy Graham Evangelistic Association, The Cove, Dare To Be A Daniel, Billy Graham Library, e Franklin Graham Festivals. 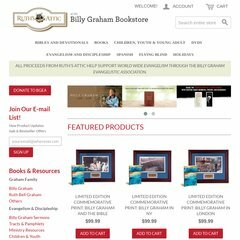 billygrahambookstore.o.. Nearing Home: Thoughts on Life, Faith, and Finishing Well ..
billygrahambookstore.o.. What I Learned from a Simple Blessing: The Extraordinary Power of ..
Os 2 nameservers são ns02.bgea.org, e ns01.bgea.org. O endereço IP do servidor do site Billygrahambookstore.org é 66.194.218.202. Está hospedado em Innovative Inc North Carolina, utilizando um servidor Microsoft-IIS/6.